The weather forecast was not good despite being the middle of summer but nonetheless at slightly after 10am two hardy souls set off from Garrigill up the Pennine Way in the direction of Cross Fell. It would be nice to say that during the next four hours there was a mixture of sunshine and showers however on this occasion it was a mixture of showers and more showers. Good time was made up to Black Band then the question was where to leave the Pennine Way and head over Rotherhope Fell to the trig point above Greencastle. A path of sorts and a gate in the fence looked to be a good bet. Then when the path veered a little too far to the left it was to the open moorland and head directly for the trig point clearly visible half a kilometer or so away. From the trig point there should have been good views towards Cross Fell however this particular day the cloud was down. 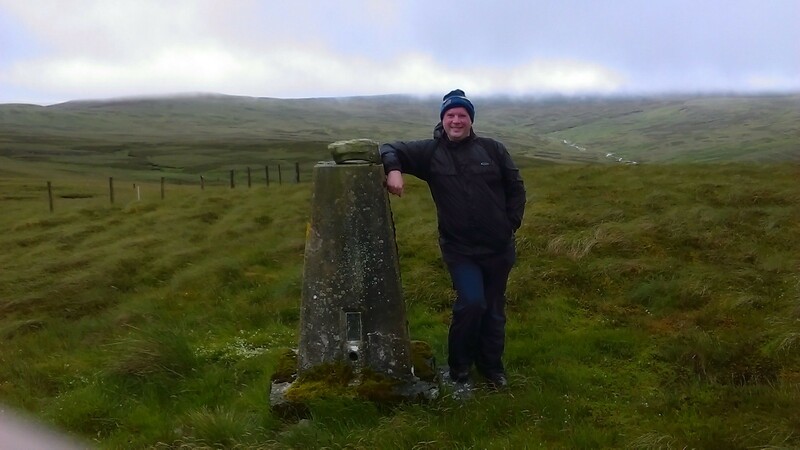 From the trig point it was to Greencastle Tarn which looks much expansive on the map than in reality but from there a good path can be followed all the way back to Blackburn Bridge at Leadgate and thence to Garrigill. At roughly ten miles this was not only the longest walk so far undertaken but also both the most strenuous and the most enjoyable despite the less-than-ideal weather. Our two intrepid heroes were unanimous that the walk should be repeated on some future date preferably when there is a nice covering of snow on the fells.